My name is Jordan Keesling, I attended Purdue University for mechanical engineering technology (2012-2016). I am currently a facility test cell technician at Allison Transmission in Indianapolis. My interest in vintage vehicles guided me down the mechanical career path. I own several old Ford trucks, I have restored two, and the others will be done as time permits. 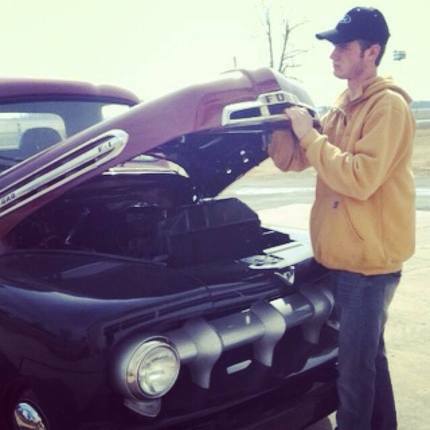 At the age of 12 my first truck was a 1952 Ford that my grandfather helped me restore completely to original specifications. I completed it when I was 15 and I won a Second Junior (AACA) at the 75th anniversary meet in Louisville. In addition it has won several Dearborn Awards through the Early Ford V8 Club of America. I also have my own small business restoring vintage heaters and parts. Payment - I do not currently take credit card. Paypal is the preferred method of payment. Money orders, cashier's checks, and business checks are accepted as well. Refunds and Returns - Returns are not accepted unless the item is not as described. (I am the only one who works this website, so everything will be described to the fullest. If you are ever in doubt, ask questions. Refunds will can be accepted if the buyer pays the return shipping. Then only the sale price will be refunded.